The Toyota Highlander is a midsize crossover SUV that was introduced to the North American automotive market in 2001. The Highlander was built on the platform of the Toyota Camry, giving it a car-like feel, with the capabilities of a sport utility vehicle. It has been a popular nameplate in Toyota’s lineup since it was first introduced, and the SUV continues to impress with multiple awards and recognition. 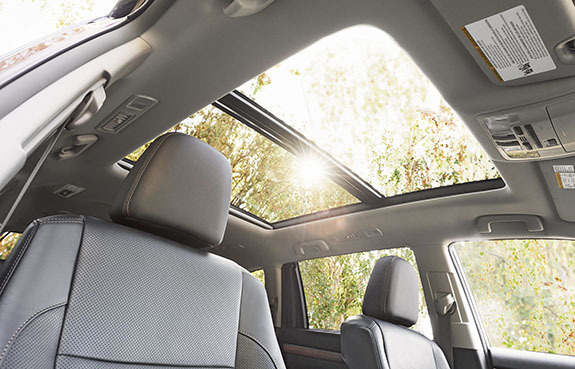 The Toyota Highlander offers seating for up to eight passengers, and features a third row of seating to accommodate its full capacity. The 2015 Toyota Highlander was named one of the 15 Best Family Cars by Kelley Blue Book, giving the SUV a clear advantage in the family-vehicle segment. Drivers who seek to save money at the pump can opt for the high-end Toyota Highlander Hybrid Limited, featuring Toyota’s advanced hybrid technology. Both the gas option, as well as the hybrid option of the Highlander, feature some of the most advanced safety features, making it one of the safest vehicles on the road today. Kelley Blue Book recognized that the 2015 Toyota Highlander was a great choice for families from the very start. The three-row crossover SUV caught the attention of the publication with it’s unique offering of standard features, convenient size, and interior comfort. A front conversation mirror helps mom and dad keep an eye on the kids in the back seats, without taking their eyes off the road. Tucked discreetly beneath the rearview mirror, this feature is as convenient as it is safe. 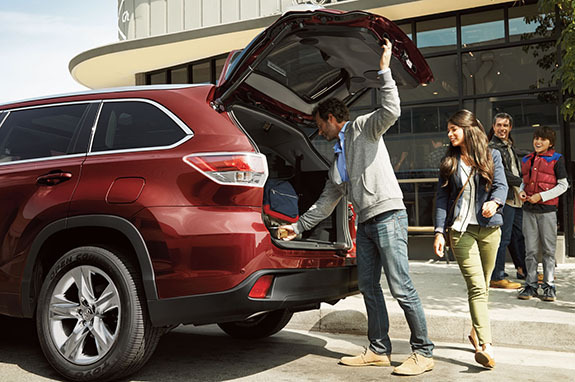 The utility and storage capacity in the 2015 Highlander is detail-oriented, keeping clutter out of the way. The in-dash shelf in the front helps corral keys, cell phones, chapstick, and other small items that tend to easily get lost. The center console is oversized, and can easily accommodate larger items like a purse, or small bag. The two rows of back seats can easily fold down to house larger items such as bikes, lumber, and camping gear. The Highlander features a uniquely quiet ride, with a strong V6 4-cylinder engine that has enough power, without sacrificing efficiency. Families can opt for the base LE, which is the most affordable option starting at just $29,665. For those who want a fully-loaded Highlander, the top of the line Limited Edition starts for only $40,090. Two other options sit between the base and the high-end Highlander model, ensuring that there is something for every budget. The 2015 Toyota Highlander earned two of the most prestigious and sought-after safety awards around. The Insurance Institute for Highway Safety named the 2015 Highlander a Top Safety Pick+ with optional front crash prevention technology. The government’s very own National Highway Traffic Safety Administration also recognized the high-safety standards of the 2015 Highlander, giving it a 5-Star Overall Safety Rating. Star Safety System: This suite of six active safety features help ensure total safety while on the road. With enhanced vehicle stability control, traction control, anti-lock brake system, electronic brake-force distribution, brake assist, and smart stop technology, the 2015 Highlander is equipped for whatever lies ahead. Ventilated Disc Brakes: To keep braking discs cool, the Highlander’s front brakes feature a ventilated design, helping to dissipate heat, and ensure that the vehicle will always stop when it should. Advanced Airbag System: This dual stage driver and front passenger airbags, a driver knee airbag, a front passenger seat cushion airbag, and roll-sensing side curtain airbags for all rows - help keep your most precious cargo safe. For families seeking the space and convenience of an SUV, with the fuel economy of a midsize sedan, the 2015 Highlander Hybrid is the perfect choice. One of the only hybrids on the market to feature all-wheel drive, the Highlander Hybrid is the cutting-edge SUV for environmentally-conscious drivers. The most efficient Highlander model also happens to be the most luxurious in the lineup. Featuring a 3.5-liter V6 engine with an electric motor, the Highlander Hybrid boasts an impressive 280 horsepower, and 28 miles per gallon on the highway. The interior has enough room for seven passengers, and comes standard with plenty of luxurious amenities, for a starting MSRP of $47,750. The 2015 Toyota Highlander Hybrid is a great choice for families who seek to stay ahead of the technological curve, save money at the pump, and take advantage of Toyota’s high-end trim level - all for one great price.